Adventure games are typically my favorite genre as I enjoy exploring and finding interesting locations and exciting new items that help me further my quest that I have been set upon by starting up these types of games. Being a player more than a developer I don’t really have a formula for what makes a game special like Zelda. Interesting characters, plot progression, puzzles, dungeons, music, and the general feeling of a living, breathing world are some things that come to mind. Oceanhorn seems to completely skip the interesting character bits and the story, like so many stories, has a definite ‘been there, done that’ feel to it. Young boy loses mother and father, monsters are wreaking havoc on the apparently quite helpless inhabitants, and the only one who can save them all is a kid. I almost got through the intro without mentioning Zelda twice. This is basically a Zelda for those on a tight budget. 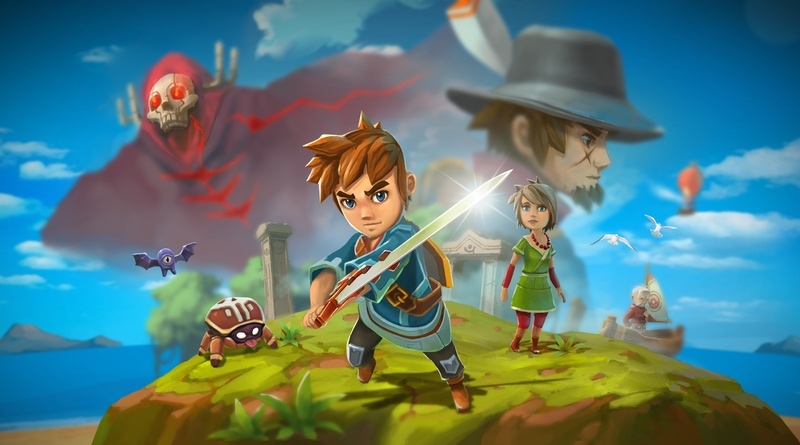 Oceanhorn rolls onto the Switch at a very nice price of $15. The best part of this title is the music. I have to admit that I enjoyed listening to it while playing and feel that it’s the game’s best feature. But when you have Nobuo Uematsu (of Final Fantasy fame) helping out you’re bound to get some good sound with your game. I don’t feel that it’s soundtrack-purchasing worthy, but it certainly adds a lot of depth to the game that wouldn’t be there if the music was awful or dry. As it is, the music fits the areas that nicely and doesn’t get tiresome or old to a point where I felt like I should probably switch to Spotify for my own soundtrack. While the graphics are very nice and colorful, I’m not a fan of the modified Lego block look for games like this. I know there are those who like it, it’s just a personal dislike for me unless it’s like Minecraft where the block style helps with placement of crafted items. I believe Creativerse and Portal Knights would be excellent examples of that. I don’t care for the graphics there either, but I understand the reasoning behind it and accept it for what it is. The style choice for this game didn’t make much sense, but I digress. Many people like it so it’s fine. The controls in the game are good and about what you’d expect. I didn’t have any trouble picking up items and throwing them in the direction I wanted. The hit boxes seemed to be tight and there wasn’t anything that alarmed me regarding actual gameplay. I think the major irritation I had was the inability to move the camera much more than a half inch with the right control stick. No rotation using the shoulder buttons or triggers. It was fixed and you have to like it that way. Fine. Why? Are you going to use the bad camera angle to hide secrets? If not, that’s incredibly lazy. Be clever. Surely that could have been one of the original ideas hashed out in this title since nothing else was original. This is where I rip this game apart for something that I laughed at and almost shut it down and deleted it from my system for. I held down my sword button and released it fully expecting it to swing in a circular motion just like in Zelda. Spoiler alert: It did. The comical part was that it gave me an achievement for discovering a secret sword move! I guess I should have tried Up, Up, Down, Down, Left, Right, Left, Right, B, A, + . Maybe then I would have found a secret, better game? Very good music, nice graphics, and solid gameplay make this a title definitely worth the price of admission. I know I gave it a hard time, but the reality is that they are selling it to us for a reasonable price and it’s definitely worth that in entertainment value. For the price of seeing a movie at a theater you can get a good amount of game playing time wherever you like. Just be warned that it has a story like you’d expect from the low price tag. Besides, I love movies that critics rip apart and there are games that are hated by reviewers that I enjoy quite a bit and wonder why they were so hard on the game. If you are bored with what you have and would like a Zelda-style game and can go into it with low expectations, you might be surprised by this title and how much fun it can be. There were some moments where Oceanhorn was entertaining. Overall, I would recommend it because the price point makes it an excellent value. We’ve seen worse games sell for quadruple the price, so give it a shot! If you like played the 2D Zelda titles you would most likely enjoy this one. It’s almost a clone in every way. Sure, the formula works, but it just doesn’t have the same feel that other games in this genre have. It’s missing depth and originality. The price point gave it an extra half point in my final score.